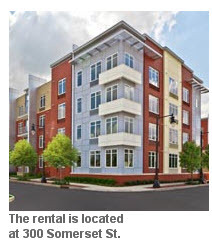 HARRISON, NJ–Meridian Capital Group has negotiated $49,950,000 in permanent financing for the first multifamily rental building to open last year at the huge Harrison Station development here, GlobeSt.com has learned. The pioneer building was a joint venture by Ironstate Development and the Pegasus Group. The 10-year Freddie Mac loan carrying an interest rate of 3.69% was provided by Beech Street Capital through its correspondent relationship with Meridian. David Cohen and Russ Drebin, both based in Meridian’s Iselin office, arranged the transaction. Furthermore, the timing was good, said. Cohen. “The recent dip in treasury yields created an opportunity to secure low-cost long-term debt at exactly the same time the property began showing its full potential,” he says. Six different development companies are now at work on projects at the 200-acre redevelopment site around the Harrison PATH station, and Ironstate/Pegasus is currently building a boutique Element by Starwood hotel next to its rental building. The rental, located at 300 Somerset St. off Frank E. Rogers Boulevard, opened a year ago and achieved full lease-up within nine months. The four-story complex stands adjacent to the train station, and features an attended lobby, a fitness center, an outdoor pool and volleyball court, lounge, and garage parking — all within walking distance of the Red Bulls major league soccer stadium. Meridian Capital Group is based in New York, with offices in New Jersey, Maryland, Illinois, Florida, Arizona and California. It arranges financing for deals from $1 million to more than $500 million in a diverse array of property types: multifamily, co-op, office, retail, hotel, and mixed-use, industrial, healthcare, student housing, self-storage and construction properties.